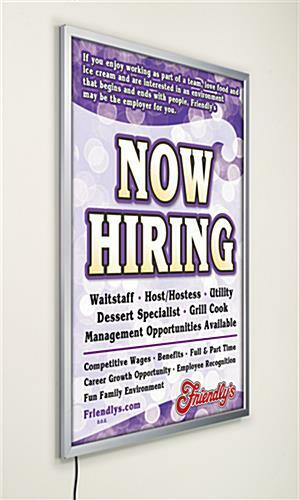 This Well-Lit Sign Supply For Permanent Wall Mounts Has Snap Open Frames For Easy Changes! Order This Sign Supply Before 1 p.m. And It Will Be Shipped Out Today From Our Quick-Ship Warehouse! 22" x 28" 22" x 56" 24" x 36"
36" x 48" 36" x 72" 47" x 94"
Never change your bulb! Lamp/bulb life is over 100,000 hours (when used 24 hours, 7 days per week) before anticipated degradation - that's over 11 years! 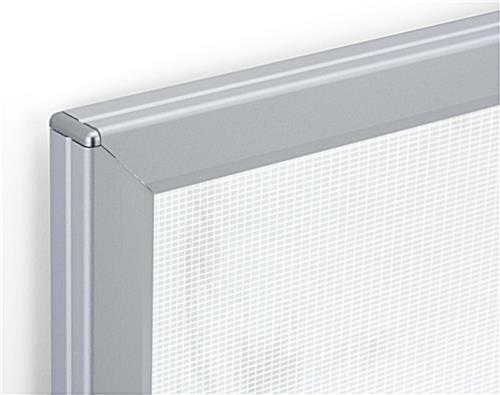 Although it initially is more expensive than a conventional illumination panel, this sign supply has several advantages that help to balance out the costs. 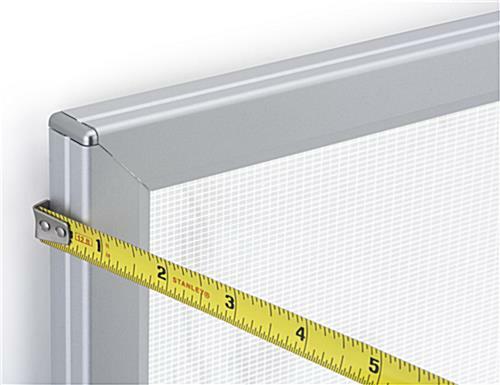 Because LED bulbs are smaller and more capable than neon bulbs, this snap-frame illuminated display is thinner and will in reality save you cash in the long run (in electrical power bills). Every durable LED sign supply for commercial usage also includes a life span of over 100,000 hours when utilized every day, seven (7) days a week. That means you won't have to worry about changing your bulbs or replacing your LED frame for over eleven (11) years! Due to its long life span, a backlit frame is an ideal long-lasting fixture in airports, shopping centers, and stadiums. 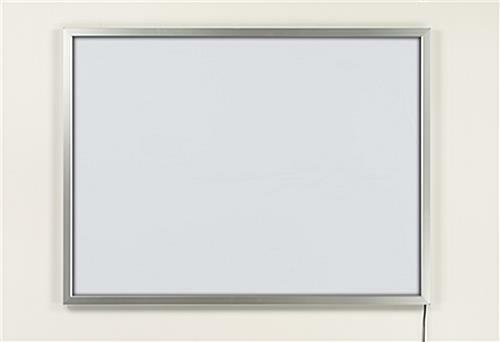 At 27" x 41", this sign supply is also flawlessly suited to accommodate common sized cinema signs. Please Note: LED lights are not measured in terms of Kelvin; our best approximation is a 6500 Kelvin color rating. Nevertheless, our company does not warrant this measurement, as it is actually an approximation by us. The producer of LED lights does not officially measure officially Kelvin Color ratings. Powered by breakthrough LED technology, this sign supply provides vibrant, even illumination in our thinnest profile ever. Measuring merely .88" thick, this attractive sign supply from our supplier is one of the most beautiful LED frame showcases for sale today. With tiny LED bulbs constructed into the sides of the framing, every sign supply illuminates your translucent images to make a astonishing artistic exhibit without hot or cold spots. A special diffusion pattern in the sign supply frame assures that all you view is vibrant, shadow-free illumination, even in extremely big measurements. With a "clip-open" border, this sign supply is also extremely utilitarian. You are able to modify your images with little stress without even detaching the panel from the wall. 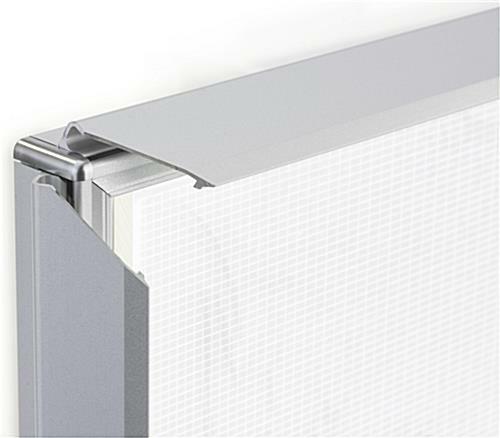 Suspended mounts enable you to attach your sign supply in landscape or portrait orientation, while rounded corners guarantee that no one gets scratched on sharp edges.